Did you guys see the news about Orlando Food Not Bombs. Their case set a precedent! ORLANDO, Fla. — A controversial group that feeds the homeless didn’t waste any time after winning a major legal fight. The group Food Not Bombs held a feeding in downtown Orlando on Monday. 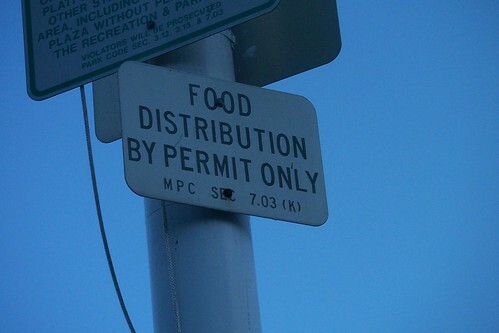 It came just days after a judge ruled that a city ordinance banning mass feedings violated 1st Amendment rights. More than 60 homeless people had breakfast at Lake Eola Monday morning, three days after a federal judge threw out the city’s anti-feeding ordinance and lambasted city leaders for having passed it in the first place. “It’s something positive. We can put aside all the stresses. It was hard work, but the work was worth it, you know,” said activist Eric Montanez. Montanez spent time in jail for violating the ordinance drafted two years ago. City leaders reacted after getting numerous complaints from nearby residents and business owners that the large group feedings increased crime and litter. “The city had no intentions of fixing this problem, helping this problem. It simply wanted to pick the problem up and move it where they couldn’t see it,” said activist Jennifer Hoag. Representatives from Orlando Food Not Bombs never stopped feeding the hungry. Montanez went to trial and was eventually acquitted. Lawyers then sued the city and people like Bruce Shawen are ecstatic. “To me, this is the greatest victory we could possibly ever have,” he said. It might not be the end of the controversial issue. The city could appeal the decision. No matter what happens in the courtroom, nothing will change what activists say will continue to happen at Lake Eola. “We’re gonna bring out good, delicious vegan food and share it with people who are hungry,” Hoag said. The final totals aren’t in yet, but a city representative says Orlando has spent about $35,000 fighting for the ordinance. City taxpayers will likely have to pay the activists’ legal bills. They’re estimated at $200,000. Thanks for posting this! And yes, it’s a great precedent.